Having a Hawaiian BBQ is a great way to celebrate spring and warm weather. Chef Bonz of Lahaina Spice company recommends his Paniolo Prime Rub to give your BBQ a burst of gourmet Hawaiian Flavor. Just sprinkle Paniolo Prime Rub on your meat as your grilling or after the BBQ had been cooked. You’ll love the flavors that explode in your mouth with this Hawaiian BBQ spice blend. Paniolo Prime Rub ingredients include a special blend of Hawaiian Alaea sea salt, Telli cherry pepper, garlic, onion, rosemary, coriander, thyme and marjoram. There are no additives and no MSG so all you’ll be getting is great Hawaiian BBQ flavor with this spice. “This rub was specifically developed for prime rib” says Chef Bonz, “but is also great for pot roast, London broil, steaks, and all other fine cuts of meat.” Others have used Paniolo Prime Rub on steaks, burgers and many other types of red meats. “I’ve used Paniolo Prime Rub on steaks & burgers. Paniolo Prime Rub is my first choice when it comes to seasoning beef. I think after you use Paniolo Prime Rub, it will be your first choice too.”, says John Dair of Orange County, California. 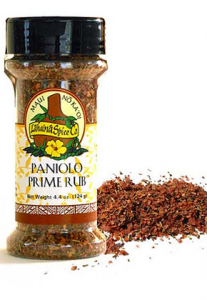 Paniolo Prime Rub is just one of Chef Bonz creations of gourmet Hawaiian spice and seasonings. During his thirty hears of being a Hotel Chef and Restaurant Chef, he’s created some of the most delicious spice blends for the countless number meals for thousands of island visitors from all over the world. There’s nothing else like this when it comes to blending Hawaiian spice and flavors. Get your Hawaiian BBQ started by visiting Get The Spice and start your collection of gourmet spice and seasonings today. Aloha from Chef Bonz and Get The Spice!